I've uncovered five common errors on the hair loss diet in coaching. There are many more, but these are the ones that really stand out, and can seriously affect your progress. I've listed them one to five in the order of importance. A coaching client will come to me and say, "I'm on the hair loss diet, and I've started by removing every ounce of fat from my diet." This is a huge error. Eating an extremely low fat diet is not only dangerous to your overall health, it's devastating to your hair. Your hair's growth is controlled by hormones which are composed of cholesterol and fat. Fat intake is super important to the health, sheen, growth and texture of your hair. On the hair loss diet, you are encouraged to eat the chicken skin! Eating low fat is a huge mistake made by many people who start the hair loss diet. We remove sugar, not fat. A low fat diet will stall hair growth and produce dry, brittle hair. It is absolutely imperative that you consume fats for healthy hair growth, including saturated fat. In our ebook The Hair Loss Diet Quick-List, we point this very important fact out. It's very important to erase the media message that low fat is healthy. If you haven't read our page, "The Health Benefits of Fat," please do so now. This page explains in great detail why this ancient, outmoded message is wrong. Click the link below to read the page. There's three ways that I've seen my clients combine their food improperly. The picture to the right was used with permission from a client who is currently in coaching. 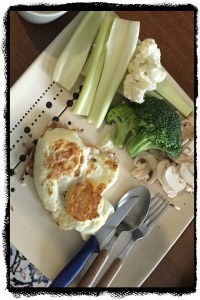 This meal contains two fried eggs, broccoli, cauliflower, mushrooms and celery. This example does fit the guidelines of the hair loss diet. It's also considered a phase 1 Atkins meal, which will drop your weight like a ton of bricks. There are no solid carbohydrates at all. If you eat like this, you're going to look like the "Thin Man" in Stephen King's novel. Non starchy vegetables are technically carbohydrates, but they will not allow you to sustain weight. Add brown rice flour bread, brown rice, dried beans, quinoa, nuts and seeds, sweet potatoes and yams. One of the biggest complaints I get on the hair loss diet is too much weight loss. Now you can see with clarity why weight loss programs are bogus. With a little education, you can lose weight faster than any paid diet program. For example, steak, potatoes and green beans are not processed foods, which is required on the hair loss diet. Potatoes are high glycemic, green beans are technically not a vegetable, and industrial beef should be watched very closely. If meals like this dominate your food intake, your diet is not optimized for hair loss. A meal like this is straddling the fence. Although technically it's not heavy, processed food, it will not have much of an impact on hair growth. Another food combining issue I've seen is for breakfast, you're eating only fruit, in the afternoon you're eating a bowl of beans, and at night, a salmon steak. You'd be surprised at how many people do this, especially students who are pressured for time. This is not food combining the way that is optimized for the hair loss diet. This type of meal combining is not going to regrow hair the way you need it to because there are incomplete proteins and zero greens. I'll say to a client, "Eat red Swiss chard." They'll say, "I don't like red Swiss chard." I agree. Red Swiss chard tastes terrible, and there's not a lot you can do about it. Red Swiss chard is a nutrition powerhouse that is like taking 10 vitamin pills. Foods that taste terrible make your hair grow and turn off the hair loss gene. No medication on earth can compare to what food can do. So please, enjoy the horrible tasting foods on the hair loss diet at least two or three times a week. Maybe at some point you'll begin to like them. This one is huge. Lots of people go on the hair loss diet, and they will become super excited because their hair is growing back. They're skipping along through the diet, and within three months, they think they're done because they see new hair. The three-month mark is the most critical stage, because that's when the hair loss gene is actually beginning to turn off for most people. The hair loss diet is for the rest of your life. This is a permanent adjustment. If you go off of the diet, your hair will fall out again. I've seen too many people re-experience the heartache of hair loss after regaining their hair. The great news is it always grows back. The very fact that it grew back in the first place means it will grow back again. 25% of people make this mistake in the beginning of the diet, so this is just a reminder. There's a 90% jump-off rate for the hair loss diet. It takes skill and determination to get where you want to be. You need tremendous self-discipline. The hair loss diet is a journey through the self. Attributes like courage, self-reflection, emotional endurance, willingness to face fears, and the ability to attack addictions are requirements, making this a very powerful spiritual journey. You cannot buy your way out of the hair loss diet. You can take the richest man in the world, and the diet will not work if parts of his psyche are not developed. If you guys need coaching on these and other concepts, please sign up for telephone coaching or email coaching, depending on your region.